Pender, who has worked at Ria’s for 13 years, took care to keep many of Pell’s favorite dishes exactly the same. The pancakes, which were among Ria’s most praised dishes, are still mixed in the same bowl. Despite the praise that the pancakes receive, Pender says that the recipe is so simple that anybody could make it at home, in theory. The ingredients, cake flour, buttermilk, butter, and vanilla, are all standard, but the secret to their success is the restaurant’s 16-year-old flat top grill. “We’ve had the flat top since we opened. It’s so seasoned that you can pretty much cook on it without oil,” Pender says. 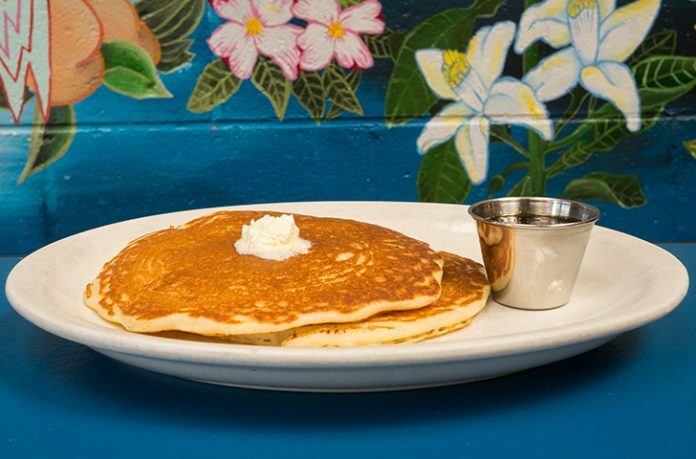 “It’s a beautiful, old albatross of equipment.” The restaurant sells an average 200 hundred orders of pancakes on most weekdays, with the numbers exceeding 350 on weekends. Three years after Ria’s death, the restaurant is still thriving. “It was really important to Ria that anybody can come here and feel welcome,” Pender says. “She created a space that everybody wanted to be a part of. And that is still here.” Pender still recognizes customers she served over a decade ago. She knows customers who met their spouses at Ria’s and still come in every week with their kids.